As a related event of Kamikoani Project, a solo show “The Game Keeper’s Jam Cellar (Mixed Berry 33)” will be held at BIYONG POINT Of Akita University of Art in Akita-city. Mixing the new works and previous works, an experimental approach to show the experience of seeing by building looking mechanism model in collaboration with the curator, Yuka Keino and the architect, Eijiro Kosugi. 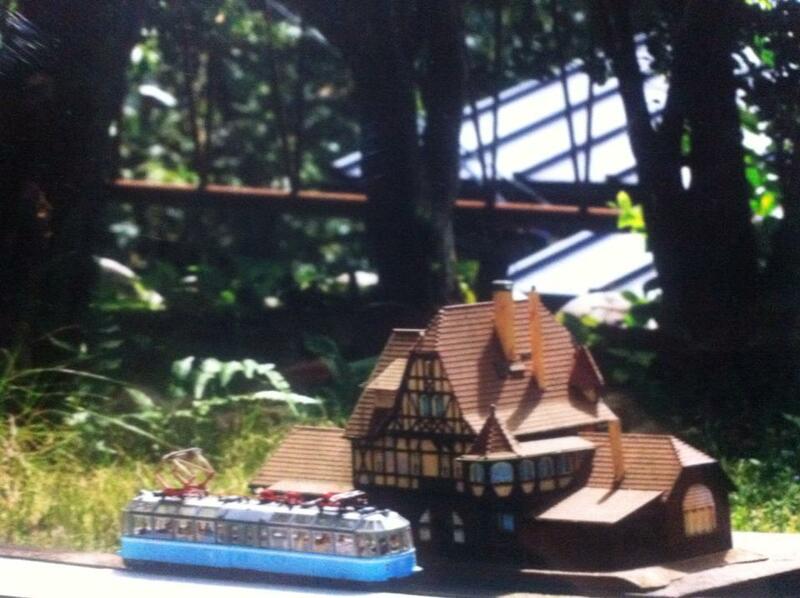 Staying and showing work in Kamikoani-village in Akita in August. Recently, I have restarted the photography series of old people’s room “The Game-Keeper’s Jam Cellar” in Yokohama supported by Koganecho Area Management Center. I will be doing a residency at Koganecho during the golden week holiday. This film is an art-science collaboration on the topic of incompatible observables in quantum mechanics. There is a lone hut in the middle of a forest where the viewer tries to observe what a strange man is doing inside. Depending on how the man is viewed, he mysteriously changes in some way. To ensure that there is no mistake, the viewer checks and re-checks the result. All the results are consistent with the rules of quantum mechanics. The film is a collaboration between Japanese contemporary artist Kyoko Ebata (http://kyokoebata.com/) and Australian quantum physicist Tim Byrnes (http://nyu.timbyrnes.net/). 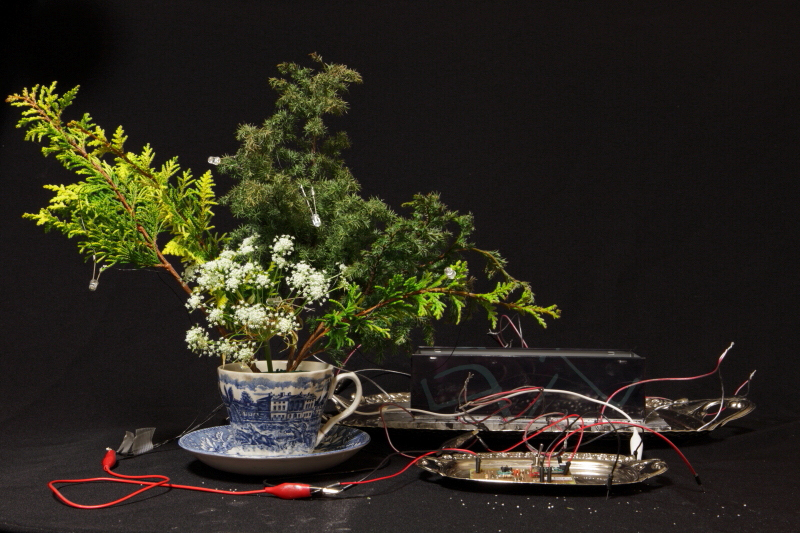 Ebata works in various mediums including photography, video, and performance. She works on diverse projects, each employing a concrete poetics to investigate or circumscribe subjects which are felt as absent, abstract, or invisible. Byrnes works on applications of various quantum systems such as Bose-Einstein condensates to quantum technologies. Special Thanks; Miho Shimizu, Eva Kietzmann (video documentation), Tatsuro Ide (Installing) and everyones who came to the performance! *Video documentation editing in progress. The show Anna is organized by a group of international artists based in Japan, Singapore and UK and is held at the studio of Dennis Tan based in Singapore. Anna is about a hole and a fictional woman named Anna. The word “ana” means hole in Japanese. 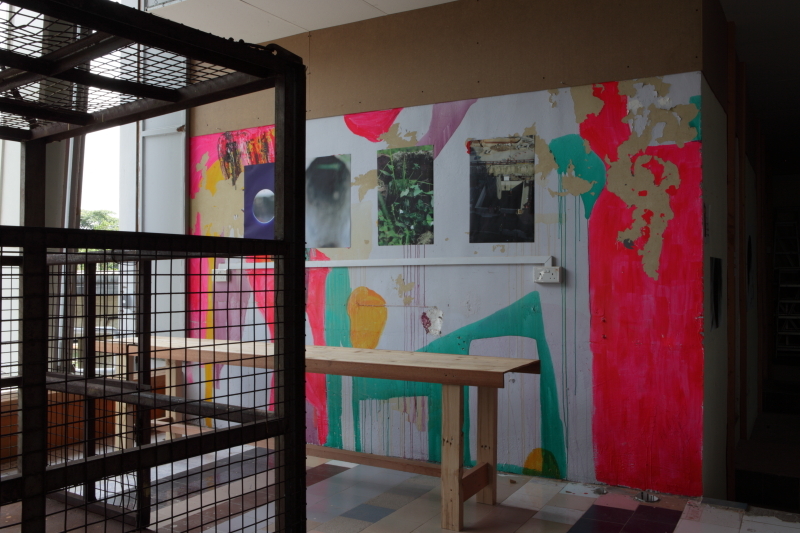 Throughout the show the artists will be showing the product of their neurotic mental journeys. In connecting holes and Annas, perhaps the most famous Anna to come to mind is Anna O, a made up name for Bertha Pappenheim who’s treatment for hysteria, a form of neurosis, by Sigmund Freud’s colleague Joseph Breuer, and documented by Freud, is regarded as the starting point of psychoanalysis. The position of the hysteric can be understood as being characterised by a deep feeling that there is a hole that cannot be filled (with libidinal implications). The hysteric may tend to seek out knowledge to fill the hole, but since the hole cannot be filled the knowledge produced is inadequate to that task. Hysteria is an orientation that is typically but by no means exclusively taken by women, and what it is to be a woman, to take the feminine position, beyond biology, can be understood as a hole in what can be known. A hole is something that is not there, it can’t be seen in itself – it is constituted to our senses by the materials which circumscribe it. This kind of circumscribed inexperience that makes a hole might lend itself to a sentiment of the sublime – a relation of awe towards the unknowable as experienced through limits. It may evoke a sense of investigation or adventure. In an old Buddhist tradition monks used to go into a hole in the ground and stay there until they die in order to become a self-mummified living Buddha, there might be a sense of being close to the death and the sublime in the act of being in the hole. Ebata has moved into an old house in Tokyo where her grand parents used to live. There is a hole in the garden but the purpose of the construction is unknown. When a gardener came to the garden, she asked him what was the purpose of the hole. He wasn’t sure the purpose but had a quick look of the hole. Ebata thought there was a dark perfect cuboid under the ground and wondered why since there should be roots of trees underground. She needed to check what it was inside.So when she met a painter who was a karate black belt holder at a dinner party, she thought he was strong enough to open the lid and asked him to help her out. The painter came to her house and opened the lid and they discussed what it the purpose of the hole. The process is documented in the video. There was the moment that he questioned what he was doing with a stranger. The meaning of the hole changes according to their interpretation and the shallow establishment of the trust with each other.The trust is based on a fictional story made in each other’s mind. Kyoko Ebata looks for holes in Singapore and Japan. Ebata finds and document holes, searching for the right hole, what constitutes the right hole is not at all clear, and she cannot find the right hole, only a series of holes which are not right, there may be many reasons that the hole is not right, although why they are wrong is not much more clear than the question of what the right hole might be. What is clear is that these holes are not the right ones. 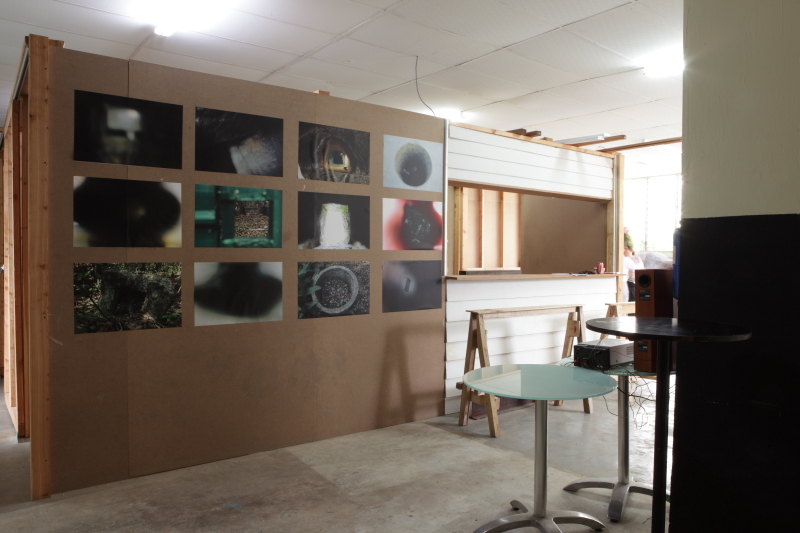 The piece will thus be a collection of photographic documentation of the wrong holes. Some of the holes have historical values, such as Bukit Brown (Chinese cemetery), a former Shinto shrine located at MacRitchie Reservoir in Singapore, as well as The Hundred Caves of Yoshimi and the cave dug by Korean people during the WWII in Japan. But they are all treated as parallel hole juxtaposed next to swede, dust shoot of HDB (housing council in Singapore), and holes of walls. Washing Hinomaru (the national flag of Japan) is a performance of a ceremony, conducting the repeated washing, line-drying, ironing, and folding of a number of Hinomaru flags. The line drying of the flags doubled as their display. Many interpretation for the performance can exist depending on the viewer’s political view. 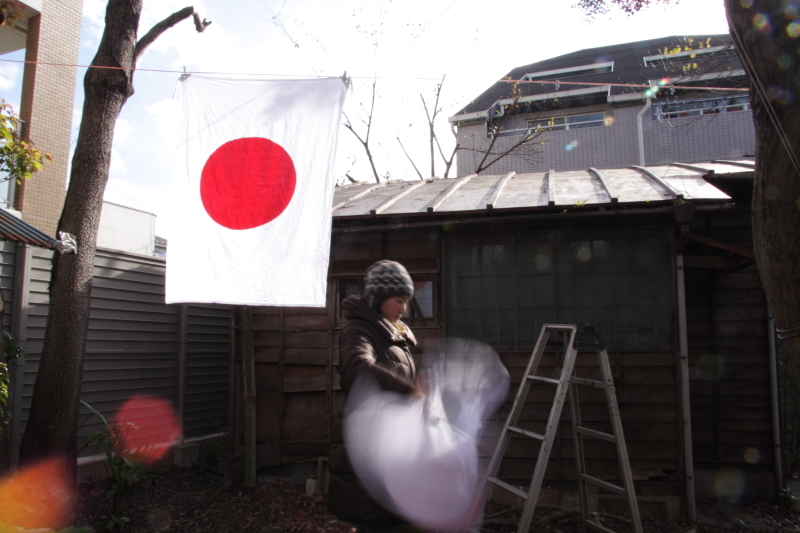 Satoshi Koganezawa commented that “the work is connected to the environment and strong enough to change the landscape.” “The performance is simple and refreshing but the act of washing Japanese flag can be as aggressive as washing Japan as a country itself. Some may be reminded of the words by Ryoma Sakamoto the end of Edo-period in 19 Century, “I would like to wash Japan again”. at an old launderette next to beautiful retro-pubilc bath during the show. A friend of mine, Tokyo based artist Kyoko Ebata, recently made an artwork that I find quite interesting. The artwork was titled Washing Hinomaru, 日の丸の旗, the Hinomaru being the national flag of Japan. The artwork, the performance of a ceremony, was conducted in a small old laundrette located next to an old bathhouse in an unglamorous area of Tokyo. The ceremony that was performed for ten days, was the repeated washing, line-drying, ironing, and folding of a number of Hinomaru flags. The line drying of the flags doubled as their display. The performance had come out of some works she had been doing which involved newly invented ceremonies which seemed to employ or explore the ways ceremonial liminal force might work. Ebata was interested here in confronting the power of the flag and its meaning. The status of the ceremony was not immediately explicated for those who encountered it – people who had come to see art, local people there to do washing, or to bathe in the bathhouse, and people who were passing who were curious about what was being done. The artist performed the ceremony herself. When asked about the meaning of what was being done, whilst acknowledging that it’s art, she offered more or less oblique but loaded responses such as saying that she thinks “the flag needs to be washed”. Such statements echo the structure that the ceremony itself in that they work as ‘oracular’ speech – speech which, like that of an oracle, is ambiguous but pregnant with meaning. Speech which calls for interpretation, drawing out interpretations that are proper to the recipient of the speech or the ceremony, and not to the speech or ceremony itself. So it came to be that as people encountered the work, they each brought to it with great certainty an idea of what the work stands for, an idea with which each was in some way comfortable, and each quite different to the next. In response to the great variety of reactions to the ceremony, Ebata started gently eliciting responses and recording them. Right wingers would see her care for the flag, and might associate the washing with the longstanding ceremonial traditions of cleansing and renewal to which they are sympathetic. Leftists would see a critique, perhaps the washing was akin to Lady Macbeth’s hand washing – a traumatised repetition, a mark of national guilt. Feminists could read a critical idea about ‘women’s work’ into the endless effort of washing. The red of the flags started to fade a little, and this too could be infused with meaning. A fashion oriented cultural critic refused to see politics, rather seeing the flags in relation to faded jeans, as a potentially marketable fashion. Some older artists were reminded of the ‘happenings’ of their youth. Others felt melancholy from various stances. From each strictly according to their disposition, each with some strength of belief in their own interpretation, and a tendency to a certain blindness to other ways of seeing it. Ebata’s recordings constitute material for another stage of the piece. Part of the originary myth of the national flag of Japan, the Hinomaru, lies in a 7th century message sent by Prince Shotoku to the Chinese Emperor, which began with words effecting “from the sovereign of the rising sun, to the sovereign of the land of the setting sun”, perhaps marked at the top with a red dot. Japan is only the ‘land of the rising sun’ from the perspective of the West (since the sun rises from the East), there is thus embedded in the Hinomaru a strand of national identity that openly defines itself intersubjectively in relation to the gaze of an other, the other of the West. To this extent the Hinomaru is a marker of intersubjective difference as such. 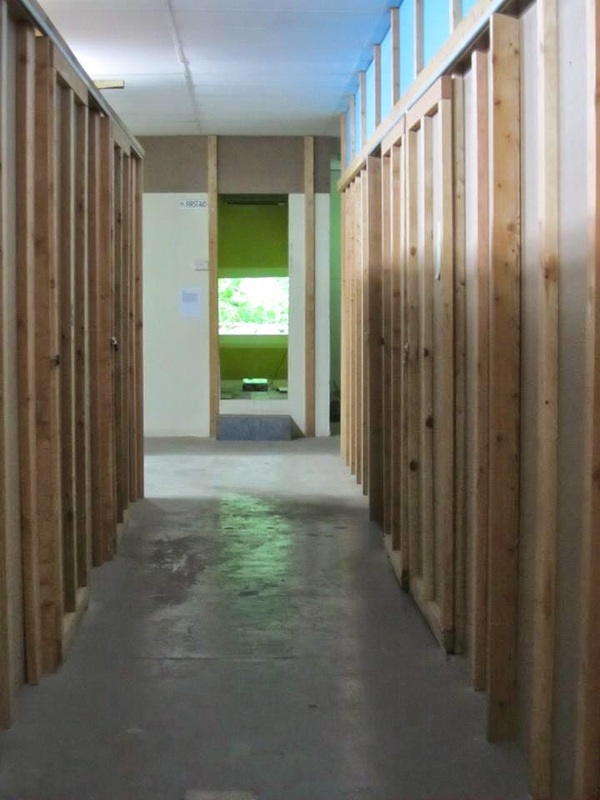 Art that functions effectively for a public is uncommon – as Liam Gillick observes, it’s easy to have an audience – a group that coalesces around what’s made or done, but it’s much more difficult to relate to the public who are greatly more diverse than an audience, for whom the work does not represent a common cause. What is interesting in Washing Hinomaru is that by appealing not principally as an artwork for an art audience but more ambiguously as a ceremony, the public was able to engage in the work. And in making that ceremony operate in an oracular manner, all participants were equal in their varied relations to the piece. The response of an art critic is no different than that of an office lady insofar as they supply the meaning of the ceremony. All are made actors in the work in a sense, their provision of meaning being part of the performance. None were privileged in their experience of the work. It’s a rhetorical claim of Thomas Hirschhorn that he is not a political artist, but an artist who makes art out of politics. The difficulty for his claim lies in the fact that there is an assumption underlying the reception Hirschhorn’s work that is broadly of the Left – imagine how we, as a typical art audience, either Left leaning or giving strong allowances to such a position, might receive the work if we assumed him to be of the hard Right. With this thought we can see the extent to which he is indeed a political artist. Hirschhorn’s position is based on assumptions of a particular audience, not the public. What might seem to be work that plays with and perhaps exposes something of the workings of political affiliation is actually a veil for a stage of those workings. Washing Hinomaru seems much more closely to fit Hirschhorn’s rhetorical claim, since Ebata’s political assumptions are not so readily available to the assumption of one audience over another. What is confronted of the flag is its effectiveness as a mark of difference as such. What can be confronted of the flag in the further staging of Ebata’s recorded material, is not just its meaning to a variety of given audiences, but the heterogeneity of it’s meanings to a public, and the gap between these. Ebata’s performance can also be compared to the work of Kumazo Yoshimura, who has repeatedly used the Hinomaru as a motif, and whose approach to the motif is comparable to Ebata’s – as a subject to be confronted. Yoshimura’s work is gallery based, and stylistically codified to be legible as art – it looks like art. His work is for an art audience, it is not public art. There is little chance that his work will elicit strong responses beyond the distanced politeness of the gallery. In this sense there is little risk in his work – there is little by the way of actual confrontation with the subject at hand, merely the signification of such a confrontation. It’s not that Yoshimura’s work is bad, it’s quite interesting and effective as gallery practice, it’s merely limited in terms of what it’s able to do with it’s subject matter. I participated in a show around Musashi-koganei in Tokyo. There is a launderette owned by an old public bath which looks like a scene in a drama. 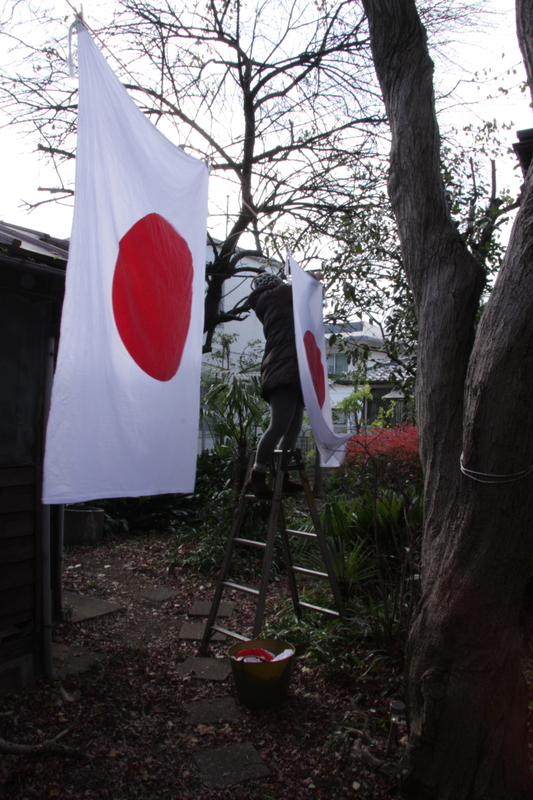 I decided to do a performance to continue the act of washing, drying, ironing and folding many Japanese flags, Hinomaru, at the launderette. 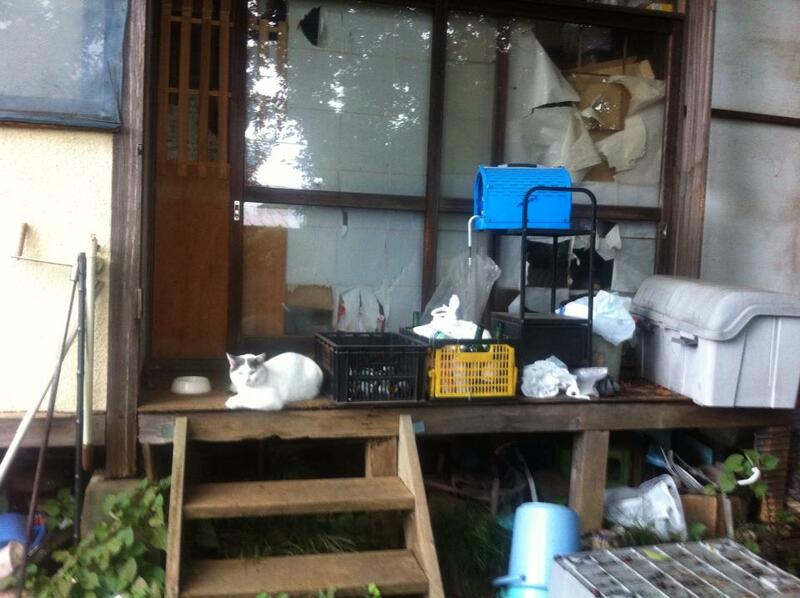 When we visited the owner, it took a little courage to go inside. Outside of the bathhouse, the overall building is grey and many parts are patched up but some parts look as if they stopped fixing in the middle. The chimney is also reinforced by some metal parts. But the reinforcement looks like it needs reinforcement. The view of the chimney sticking out to the blue sky is something. There are lots of unknown objects by the entrance and all of them are covered with dust. We entered the gate and left our shoes in the retro shoe rack with marble pattern, walked onto the wooden floor grates and opened a sliding door. The inside was a public bath in the style of the good old days. There are sofas and a table in the middle, marble patterned lockers, and a shelf with glass door selling soap bars and towels (though it looked like nothing was ever sold). The bath room in the bottom was covered with tiles and has a high ceiling. The daylight from the top window coming in at an angle looked beautiful. The sound of water pump in the aquarium was echoing in the room with the smell of soap. It is really relaxing. As we talk to the owner, we found that there were many things that he is proud of. The bath tub is made of wood and makes the water softer. The boiler is made in Canada and the parts can be replaced after a few decades of years. The bathhouse looks like fall into parts but it sounds like that the owner has progressive way of thinking. I was thinking that it would work out. As we explained the project, the owner happily welcomed our proposal. It was rainy night when I revisited the launderette. I hesitated to go inside for a while but an old lady went inside the bath so I followed her. Pink tiles of the bath and bodies of old ladies were in front of me, then lifting my eyes to upper right, the old lady totally relaxed in front of TV was sitting on the payment counter. She is the wife of the owner. I said hello and she said I could do whatever I wanted to. So I went into the empty launderette. I questioned myself what I was doing for a second but started to measure the sizes of the room. I started to notice the dust in the room, some parts leaking water, a soap looks like few decades olds, a children’s sock left behind placed on the window sill is now covered with dust. I tired not think about cleaning the space and continued working. I should not destroy the majic of the space. Suddenly a big spooky noise started. 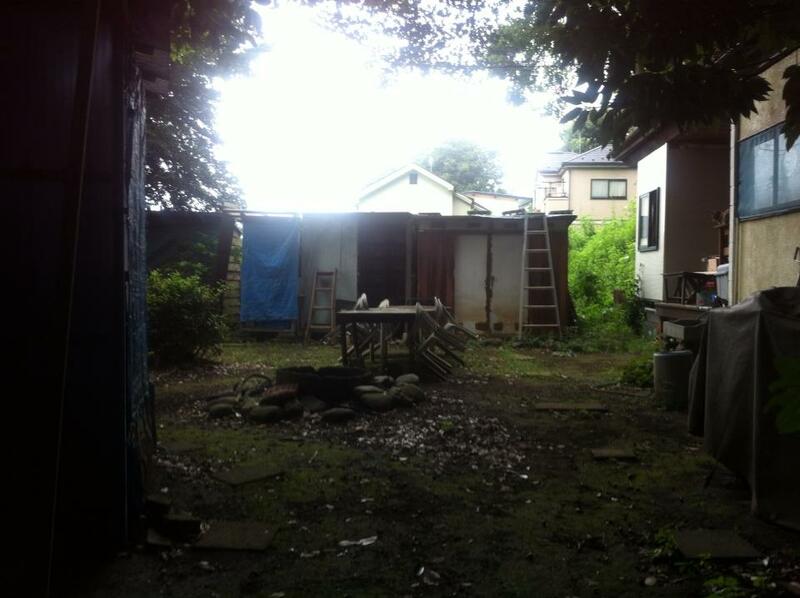 But soon I realize it is a bath house, and it was the noise of pumping water. If you don’t know what the source of the noise is, it sounds scary. Perhaps, I was feeling somewhat guilty, although I did get a permission of the performance from the owner. Then, I sensed someone was in the garage next door. The garage/loft does not look like functioning from the look but I could hear noises from there. It was again just a family was about to leave with a car. I said hello but I could see that they didn’t want to get involved much so I didn’t push trying to communicate with them. If I were them, I would leave one who is washing Japanese flags alone. The show had started. I started washing the flags. After while, I heard the owner was shouting from next door. It sounded like shouting to a dog but it was awfully aggressive. I could hear the wife was also shouting. I imagined that they were having argument because they had regretted accepting my performance and were taking out to their dog. I felt sorry. The shouting continues quite a while so I went out to find out what was going on. It was that they had a dog with bad legs and the dog barked a lot and the owner and the wife are shouting at the dog. The dog is sick and his bag legs are totally numb. The wife hanged the back legs with a harness and drug the dog to take a walk. As I visit the launderette every day, I found out that she brings the dog out to the walk at the same time every day while complaining. She said she should take the dog out for the health. The dog and the wife reminded me of the bath house which looks like haunted house but functioning and regular customers gathers every day. As I got used to it, I started see the good sides of the bathhouse. It was divided into two sections, the one for women and the other for men. The wall of the bath for women was covered in pink tiles with a windmill and Bambi, the fawn in mosaic. Fish are swimming around in a water tank in front of a big mirror. The places where people used were clean. I couldn’t help to feel that it was a shame not to clean up the stuff piled up on the sides, though. I supposed it was not my business. After 3 days going to the bathhouse, the wife started to take the performance kits outside the bathhouse since I left the flags and the iron for my performance in the back of the bathhouse just in case because the launderette could not be locked. I was somehow feeling a little bad about the performance so I was very touched by the fact and felt like she was supporting me. She came by time to time and gave me sweet potato baked in the chimney of the bathhouse. It was a very warm welcome. On the first day of the performance, a man came up to me. He was waiting for the bathhouse to open at 15:20. They open a little early for the regulrers. “I don’t see Japanese flags these days. Love the hinomaru, the red circle. If there are red lines, it will be more uplifting. “I experienced the last day of the war in Taiwan. I was 5 years old. There were bombing and we hid in a shelter. I was scared. But I like military songs. I like Taiwan. Taiwanese are pro-Japanese. I have been there for a few times for vacations. Though, a war is not good. You should take care of yourself first, then your family and then the nation comes after. He said and then went to take the bath. I saw him coming back from the bath and said hello. He was listening to another regular old lady about her cataract. The next person who came to me was an old woman wearing a knit cap and a dungaree shirt. She asked me what I was doing. So I answered “I would like to wash the Japanese flag and think about the country more seriously” Then she said “You think about Japan. It is a good thing you are doing. More people should do it”. It was an unexpected comment for me. I told the same thing to the next person who came and asked. He also gave me praise for being patriotic and asked me how much was the flag. The price I told was not reasonable for his standard and he was not pleased with it saying it is too expensive. He stuck around for a while and talked about the bathhouse. He was a barber so not very happy about the state of the bathhouse. I was sure he wanted to wash the whole things, put a hot towel over, place shaving cream , shave all the things sticking out and then finish with after shave colon. Having the unexpected reaction (usually I get ignored in Japan); I have decided to do interviews. The other artists of the show were helping me. The first person we tried was a young man who looked nice and easy going. He thought I was a part of cult so tried not to be bet involved with me. He lived in an apartment opposite to the launderette. He works as an engineer of music studio at night so he comes to this launderette before he goes to work. We got on and even talked about him making music for the video I was making. The next person we interviewed was a man who looked like hangs around in Akihabara. His impression of the performance was “Ah, these days countries like R and C are being aggressive…” I assumed R stands for Russia and C stands for China. He could see the landaulet lit at night from the window of the bus and wondered what was going on. I could imagine it would be quite bizarre. He seemed be not good at getting eye contact. The way he talked was a little bit like an online chatting. He could not tell he worked because if he did, he would be fired. Wondered where he worked. According to him the current state of the world is just like before the war. He could be serious or a little paranoid. Though we don’t think about so much but the wars are ongoing in many coteries and the foreign diplomacy of Japan had tensions. Just is was a little strange to talk about the war while doing laundry at a launderette. I met him a few times. While he was waiting for his laundry, He would squeeze his big body into the edge of the line of chars and sit tight gazing in front of him. He asked me once whether it was all right to take a picture of me with his mobile. I don’t like my picture taken but I did took video of him so I accepted the offer. On the other day he gave me a can of hot coffee. I don’t know really well but I imagined it might be a manner of Akihabara. There are people singing on the street (usually a girl) and surrounded by crowd (usually men. The size varies from just a couple of people to a few dozens of people). The crowd should not come too close but allowed to stay within certain distance (2m also?). To give a can of coffee is something that one of a few things that is allowed to give. I should go and observe then one day. Hot drinks are always nice in cold weather though. On other day, when I went in, I saw a pile of flyers. I thought the right wing people caught my performance and got a little scared. But it turned out that he was quite famous comedian called Minoru Torihada and the flyer was for his performance at a theater. I looked him up and found out he was quite cool. The organizer of the show, Keino-san contacted him via Twitter but there were no reply. I didn’t mind saying hello. And on the other day, when I was with the people who orginsed the show, a group of drunk manual labor type of people stopped by and a man asked us “You don’t look Japanese. What are you doing?” He kept on telling a little sexual jokes. I didn’t like to be harassed so I pull out the video camera and asked him questions. After while I asked him “Do you like Japanese flag?”. He answered “Of course. I am Japanese.”. 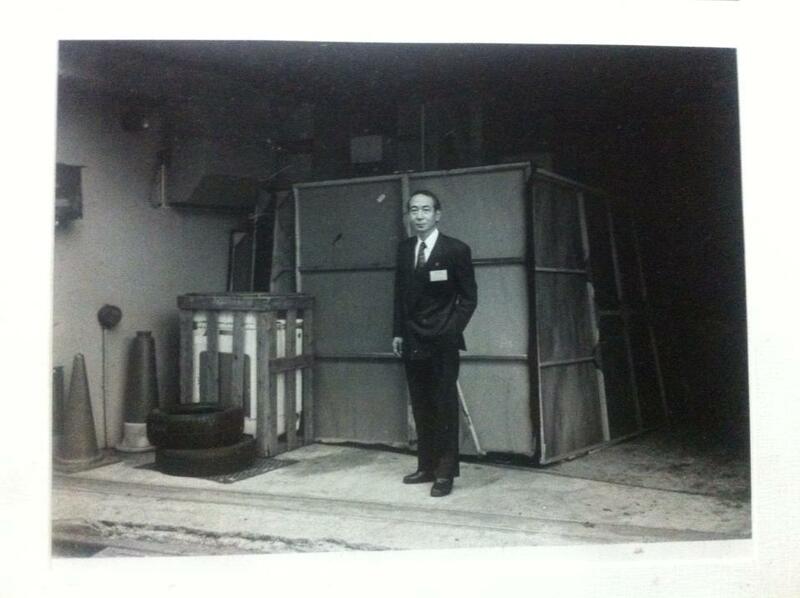 He told me stories when he worked in the Great East Earthquake area. As I listening to him I started to crying and he started to cry and we were crying together and my camera was shaking. After the bath, he was still asking to go to karaoke together, but I handled it and sent them off cheerfully. A good job I have done. On the other day, an old couple look like from Dankai-generation (baby boomer generation after the war) stopped by and said “Ah, this is a happening (a term used for performance in 60’s)”. I answered “Yes, this kind is in fashion again these days.” They looked a little puzzled saying there were many things like this in old time. Then a young girl came so we asked for her opinion. “For me, Japanese flag (Hinomaru) is about .Hinomaru lunch box (old fashion lunch made of rice and red plum pickles in the middle of rectangle lunch box which looks like Japanese flag). In Japan, a conversation often ends up in food. “So was the food good?” Cooking and testing does not have a shape. I think it is a culture very much suited to Japan. I could not interview the regulars of old women but we say hello ever time we meet and had some chat. I guess getting used to it is something like this. I had my own reasons to start this performance but when I repeated everyday life act as a ceremony by using a national flag which is a sign with open meaning, sentimental meanings were created as many people as see it. It was interesting to experience it directly through the performance. I choose not to state my own opinion since it seems close the meaning opened through the performance. I wanted the flag to be pink like red jeans get washed. But it was dyed very well and I have tried with different kind of detergent but it did not get washed away well. It was another discovery. * Currently the documentation of the performance is work in progress. Now on sale at Motto! 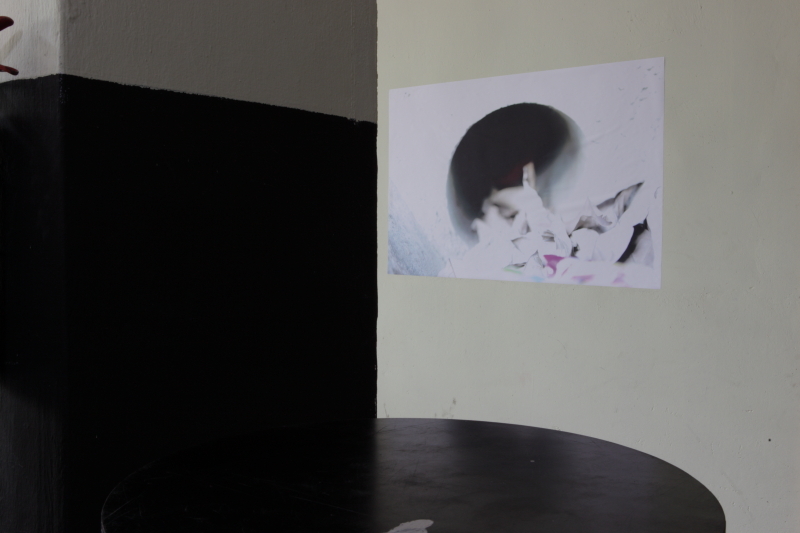 Ebata works in various mediums including photography, video and performance. She works on diverse projects, each employing a concrete poetics to investigate or circumscribe subjects which are felt as absent, abstract, or invisible with antilogy often referring to the state of society.